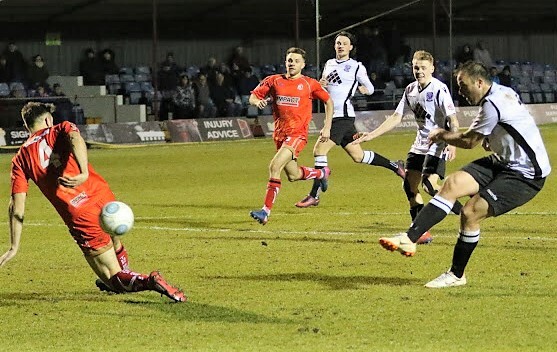 Hereford stretched their unbeaten away record to 8 games with this 1-1 draw at the Impact Arena against hosts Alfreton Town. However, the result could, and should, have been much better for the Bulls as Simon Wright explains. This was a 90 minutes best forgotten, the inevitable consequence of an end of season game between two mid-table sides. Two clubs with limited choice of players and knowing that defeat wasn’t acceptable. Alfreton played as though they were managed by a certain elderly dinosaur from Middlesbrough. Hoof! and Hoof! again as the football cried for mercy. Their manager Billy Heath has had success with that method at his previous clubs and thus has 10 of his former players with him. Both management and most players commute in from their homes further North. The Reds are a poorly funded club at our level “run on a piece of string” explained one of the stewards and are based in a small, a bit-down-on-its-luck town. They may consider out-of-county big blokes with big boots are how they must compete at this level. I couldn’t watch that regularly. With Keyon and Lance injured and James Roberts bringing a smile to Ian Long’s face, our management were limited in their attacking choices and, largely, opted to compete big boot with a big boot of their own. Such passing play that there was came from Hereford when they could find a little respite from determined tackling. Our little guys had very little success and to their credit, they stuck with the task. Loanee Waite looked as though he was our mascot rather than a support striker. The penalty was our first shot on goal. Two more decent efforts followed later in between the howitzers. Symons should have scored after great work down the left by Rowan Liburd. Alfreton briefly outmuscled our stout back four once for their leveller. Matt Yates was a calming presence with his handling throughout while Josh Gowlings’ stoutness drew mild howling from the locals. What else? I enjoyed the opportunity to offer more knowledge on Alfreton to the worldwide audience of Radio Hereford than they imagined was possible, or that they even needed. I nudged elbows with Ruth Walkden to my left, and Frank Williams on my right, which felt similar to the away seating at Kenilworth Road. This apparently was far more room than usual. Ye Gods. Should James Waite consider a new career in media, he would be well suited horizontally. He’d probably want to steer away from the food jokes, inspired by the home side having Curry and Bacon in their team and the visitors including Culliniary-Liburd and Oven-Evans. Excellent turnout of 116 Bulls in the attendance of 400+ who were largely silent all night. The segregation nonsense was quietly dropped. Lovely people the Alfreton officials. Down to earth, friendly and humorous, they did enliven the evening. Such off the beaten track towns need their football club as a focus point, a community gathering and a reason to stay local. Their average attendance was 529, possibly a little lower now which may or may not include the 150 free tickets for schools which Thorntons pay for each game. (Thorntons HQ is based nearby). Small, but equivalent to 1 in 40 of the town population, and those that turn up do care. .. albeit with much neck rubbing. Positives – another away point as our unbeaten away record continues. A well drilled defence didn’t buckle under the aerial assault. Next season will be about finding ways to win at such venues, but right now we are about building respect and continuity.